Still haven't run since Sunday 22nd February. Feel it would be fraudulent to call myself a runner at this stage... I'm also very aware of the fact that I will likely die while attempting to run the 34km option of The Hillary next weekend. The sand of Piha and Lake Wainamu, the stairs of doom at the end of the Te Henga, then a few kilometres of undulating road on the way to Muriwai and the finish line will probably do me in. I don't expect to be in any way fast, or coherent at the end when if I finally get there. It's sure to be a larf. My brain is not functioning at full capacity lately, as I have been suffering a little bit of insomnia. Going to sleep is fine, but waking up in the middle of the night and not being able to get back to sleep is starting to have its effects. I was also having trouble with waking up super early, but now I'm struggling to wake up in time. Yesterday I slept in until 8.30am (unheard of in my world), and this morning I was woken by Deane's alarm at 7am - I'm usually awake well before then. Hopefully this issue will resolve itself soon - I have a couple of assignments due in the next few weeks that need my attention. 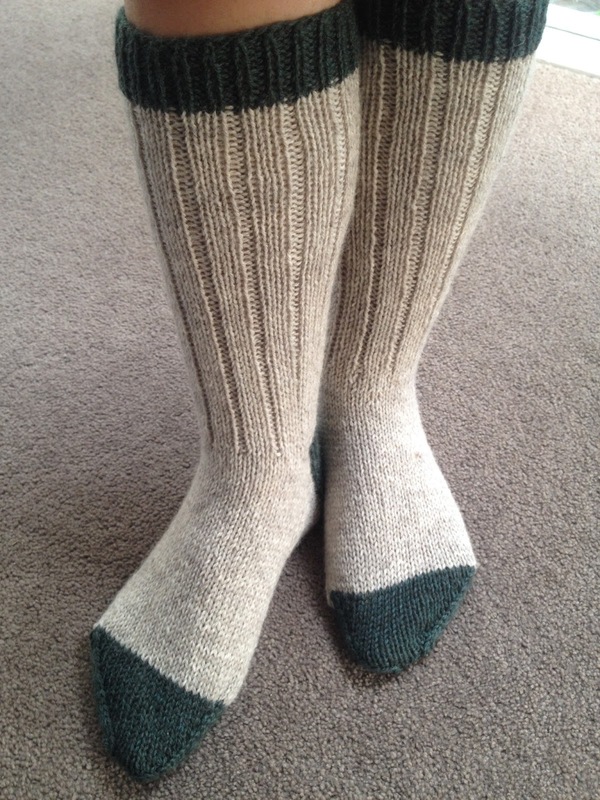 Boot socks, knit in Southlander DK weight yarn. I knit the large size, which ended up being essentially knee-high. They'll be perfect for winter! I don't expect them to be particularly hard-wearing though, as the yarn is 100% wool, and the fabric is leaning a little towards the loose-knit side. The graphics projected onto the building were quite amazing. That glow behind the Museum was the full moon starting to rise. It was perfect. The boys loved the 'light-men' walking through the audience and touching peoples heads. The evening was marred slightly by a brief downpour about 3/4 of the way through the show (not to mention plenty of rain in the few hours beforehand) but it was worth the ticket price - the fireworks were awesome. This week I'll be (trying to) focus on assignment work, squeezing in a few shorter distance runs to (belatedly try to) prepare for The Hillary this weekend, and hopefully pick up my new car. Fingers crossed all goes well :) Enjoy your week! Good luck with your run! 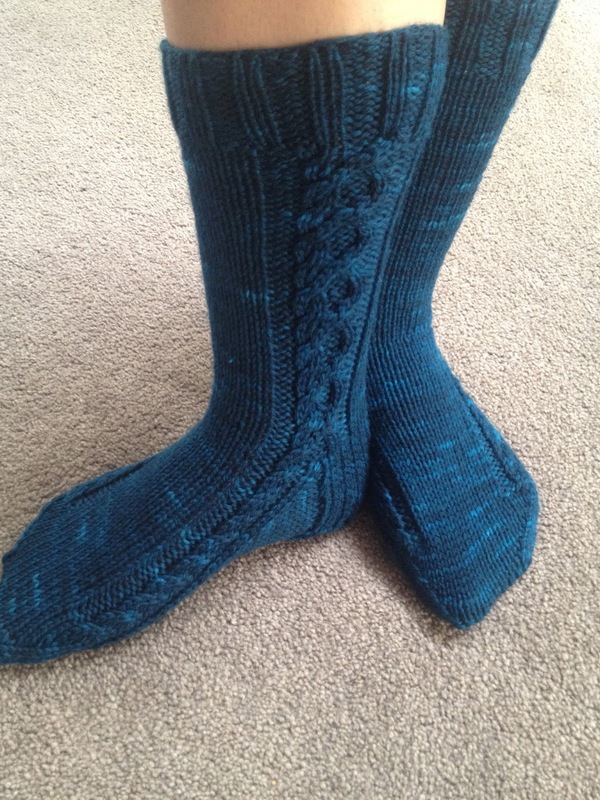 Nice socks - they'll be especially warm and cosy for winter! The light show looked awesome! What a cool idea to have light men! Thanks for sharing.